No one personifies the ties to the old regime more than Beji Caid Essebsi, the Nidaa Tounes leader, who is also the frontrunner in the Tunisian presidential election set for November 23. 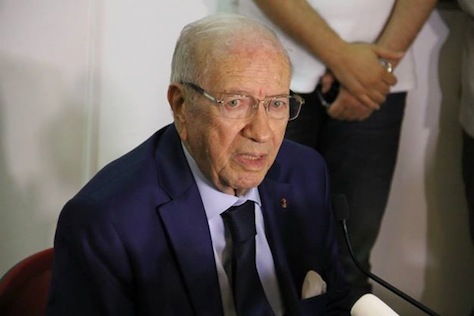 Essebsi (pictured above), now age 87, was an advisor to Bourguiba from the first moments of Tunisia’s independence, and he served as the head of Bourguiba’s national police, interior minister and foreign minister, and he served in Tunisia’s parliament during the Ben Ali era. He served as acting prime minister between February 2011 and December 2011, a stabilizing presence in the lead up to the initial post-Arab Spring elections. But there are fears that Essebsi wants to enshrine his son in power — or at least in pole position to succeed him. He’ll face an assortment of opponents, the most serious of which could include Moncef Marzouki, the interim Tunisian president since 2011, and Kamel Morjane, a former defense and foreign minister at the end of the Ben Ali regime. Ennahda, aware of the overreach of the Muslim Brotherhood in contesting the 2012 presidential elections, has announced that it won’t field a candidate in the race. If no one wins more than 50% of the vote, the top two finalists will face off in a December runoff. If Essebsi is elected, Nidaa Tounes should easily be able to form an alliance of like-minded allies, including independents and members from two additional parties that did well in the parliamentary vote, the Free Patriotic Union (الاتحاد الوطني الحرّ‎), a liberal secular party founded in 2011 by oil businessman Slim Riahi and which will be the third-largest force in Tunisia’s parliament, and Afek Tounes (آفاق تونس‎, Tunisian Aspiration), a center-right party also formed in 2011. There’s still some question about what the next Tunisian government will be able to accomplish. But it’s easier to unite against the bogeyman of Islamist fundamentalism than it will be to form a coherent package of economic reforms that could transform the Tunisian economy. Many of the ‘technocrats’ within Nidaa Tounes are former labor officials who have no love for the kind of liberalization and structural reforms that could unleash higher growth and more jobs (or even reduce Tunisia’s stifling bureaucracy), and the coalition’s top economic adviser, Mahmoud Ben Romdhane, is a former leader of the Tunisian communists.